Many new and exciting APH products recently became available and we couldn’t wait to share them with you! Here are your new products for a new year, with links to their Shop.APH pages for additional information and ordering procedures! All are available with Quota funds. This is the third module in this tactile/visual science series. Unlike previous modules of this series, this set of materials is appropriate for a broader range of ages and grade levels of students with visual impairments and blindness. Activities incorporate a learning objective, a list of vocabulary and needed materials, a step-by-step procedure, extended activities, visual adaptations, math and language connections, and science tidbits. Activities are complemented by the included visual/tactile overlays and fold-out 2-dimensional displays. A large print guidebook (braille edition available separately) with easy-to-follow activities, a glossary, and a list of resources and related web sites. A variety of visual and tactile overlays that can be used alone or with the optional APH Light Box or Mini-Lite Box (sold separately). Two trays designed to slip under a light box ledge and provide a secure working area when using the overlays. Astronomy Worksheets include print, braille, and CD-ROM files of the following worksheets for student completion. The CD-ROM contains the worksheets in these file formats: MS Word, PDF, and braille-ready (.brf). Notes: Each overlay set is housed in its own protective and labeled clear-view folder. Braille labels are included for customer application. Additional sets of Quick Fact Cards and Astronomy Worksheets are available for purchase separately. The Building on Patterns series addresses phonemic awareness (ability to hear and interpret sounds in speech), phonics (the association of written symbols with the sounds they represent), comprehension, fluency, and oral vocabulary, all of which have been identified as important for reading instruction. It addresses language development, sound discrimination, tactual discrimination, and concept development. Braille contractions are introduced from the beginning along with sound and letter associations. Objectives for each of the above key concepts have been aligned with the Principles and Standards for School Mathematics from the National Council for Teachers and Mathematics (NTCM). These lessons make use of routine, non-routine, and open-ended problems, with writing activities that require students to explain their solutions. This print/braille storybook series helps bridge the gap to abstract tactile graphics. Moving Ahead: Tactile Graphic Storybooks are designed to be the next step for preschool and kindergarten students who have had some experience with simple tactile representations, such as those in APH's On the Way to Literacy series. Three Moving Ahead books are now available: The Boy and the Wolf, Splish the Fish, and Goin' on a Bear Hunt. Each storybook includes a Large Print Reader’s Guide (braille edition sold separately) that contains general information, tips on using the storybook, and additional resources. Also included are braille words on customer-applied labels, allowing the reader to choose contracted or uncontracted braille. This rhyming story features a twist on the classic tale of the boy who cried wolf. Simple raised line symbols represent the Wolf, the Boy, and his small flock of sheep. As the story is read, the child is invited to tactually search the page for these characters, to count and compare like and different pairs of sheep, and notice differing orientations. The story and its graphics introduce a variety of concepts: left, right, top, bottom, near, far, first, last. A simple key presents the symbols used in the book. Includes a storyboard and symbols for the story’s characters, which permit the child to create his own tactile displays. 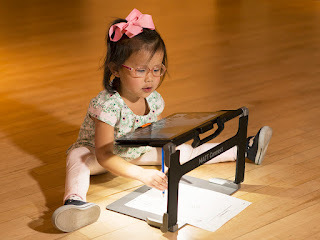 As the child retells the story using the storyboard, he gains understanding of how tactile graphics can be used to symbolize objects and show spatial position. Recommended ages: Preschool through 2nd grade. This attractive, sturdy backpack is a perfect solution for organizing and transporting equipment and tools used by students and professionals with visual impairments. Developed as part of the revision of the Transition Tote System, this backpack is designed to serve the changing needs of persons with visual impairments. Contact us if we can assist you with your product purchase plan.